KDM Contracting, Inc. is a 29 year Arizona Based company specializing in Commercial concrete and masonry. We believe that good customer service begins long before – and ends long after we complete your job. KDM Contracting, Inc. will diligently work through the bid and pre-construction process together with you. Our superintendents will communicate with you every step of the way through project completion. KDM Contracting, Inc. will begin with accurately scheduling and preparing for a timely and effective project start, we’ll adapt to the unexpected changes that always seem to occur, we’ll be responsive to your needs by utilizing our talents to streamline the process, where possible, we’ll apply innovative solutions to complex issues that arise. After the jobs completion, we’ll inspect and verify with you that your needs were met. We are committed to long term customer satisfaction, and offer our clients quality work completed in a timely fashion. 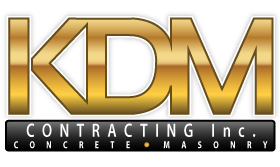 KDM Contracting, Inc. uses only the highest quality products that the market has to offer. We take pride in what we do and stand behind all of our work.